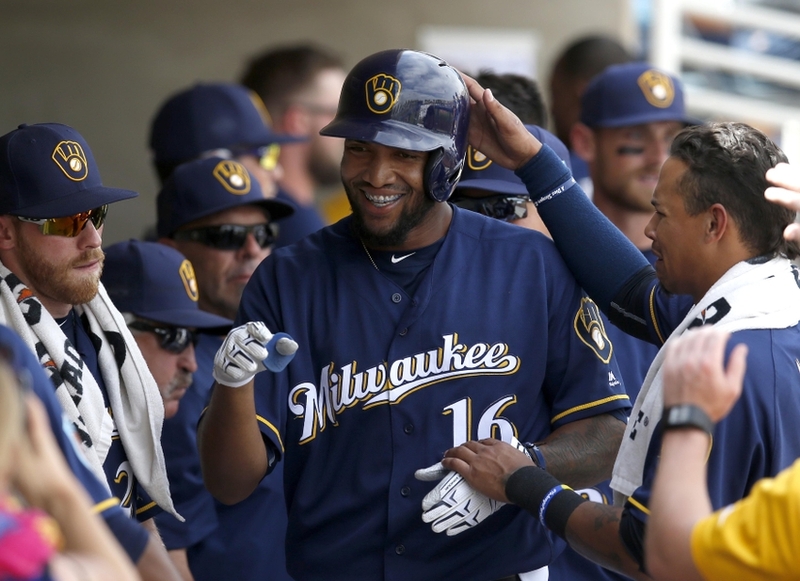 PHOENIX — Domingo Santana already knows what will be going through his mind when he steps to the foul line at Miller Park for his first big league Opening Day. Santana’s father was a strong-armed outfielder and pitcher also named Domingo Santana who played in the Astros’ Minor League system. After his playing career, he settled in St. Thomas, where the younger Domingo learned English, played trombone in his school marching band and learned the baseball skills that earned him a contract from the Phillies in 2009. Until this month, Santana had not spoken publicly about his brother, Yoangel, who was 18 when he died from a gunshot wound the same year Santana signed. Yoangel was at a party, Santana said, when shots were fired and he scurried for safety. Santana often thinks about his brother when he’s on the baseball field. On the brink of his first full Major League season, Santana is a breakout candidate for a Brewers team going through a rebuild — and perhaps a poster child for that process. The slugging, strong-armed Santana was one of four prospects, with fellow outfielder Brett Phillips and pitchers Josh Hader and Adrian Houser, acquired from the Astros last July for Carlos Gomez and Mike Fiers. On Aug. 21, Santana became the first of the newcomers called up to Milwaukee. Considering Santana had just turned 23 and logged all of 20 games in the Majors with the Astros, the Brewers expected to see a raw talent. Instead, the player that manager Craig Counsell saw possessed a surprising level of baseball smarts. “The thing that impressed us all was his ball/strike recognition,” Counsell said. “You feel like it’s a skill that can still grow. I think we’ve seen signs of it in Spring Training, that it’s going to grow. It’s generally a trait that you see as you age, it gets better and better and better. In 121 late-season at-bats with the Brewers, Santana hit .231/.345/.421, with six mostly opposite-field home runs and 21 RBIs. In the Minors with the Phillies and Astros — he was traded by Philadelphia to Houston in the 2011 Hunter Pence deal — Santana’s on-base percentage was .373. Counsell is still mulling where to bat Santana this season. He’s a candidate for the leadoff spot because of his robust on-base percentage, but also has middle-of-the-lineup appeal because of his power. Counsell made the comparison to Corey Hart, another tall outfielder with power who batted all over the lineup.